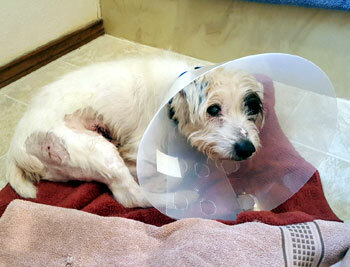 News and Events - Page 3 of 4 - Russell Rescue, Inc.
Sammie was hit by a car. She was found laying in the street. Her leg is broken. As you can see she is in a great deal of pain. She will need surgery to repair her leg. Can you find it in your heart to help her? Sammie is heading home for the night, poor kid. Another 36 hours on pain medications, and then she can see the orthopedic surgeon. Fractured pelvis and severely broken leg. She’s going to make it though! They said everyone loved on her all day! Guess someone goes to work with me tomorrow. 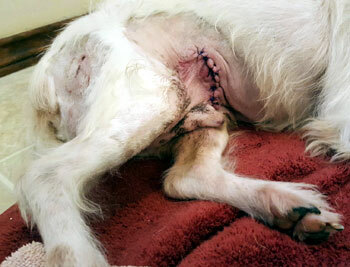 Help Sammie with her “good as new” surgery! 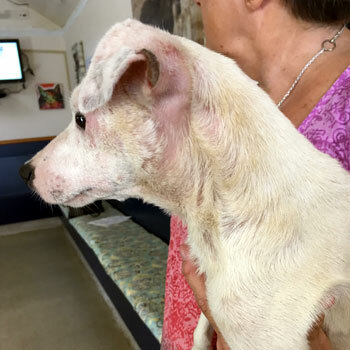 7/21/17 – Here is Fannie almost completely healed up. 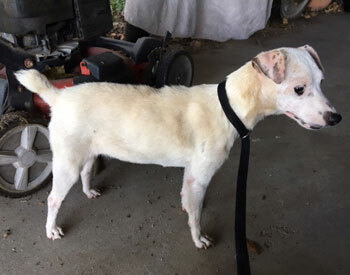 The hair on her ears and her tail has grown back but it is still a little thin and we feel that it will be back to normal in a couple of weeks. There is still some staining on her back and that will go away with time. She feels wonderful and has plenty of energy. 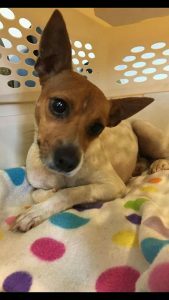 Fannie is ready to find a new home! Thank you for your support! Fannie thanks you! 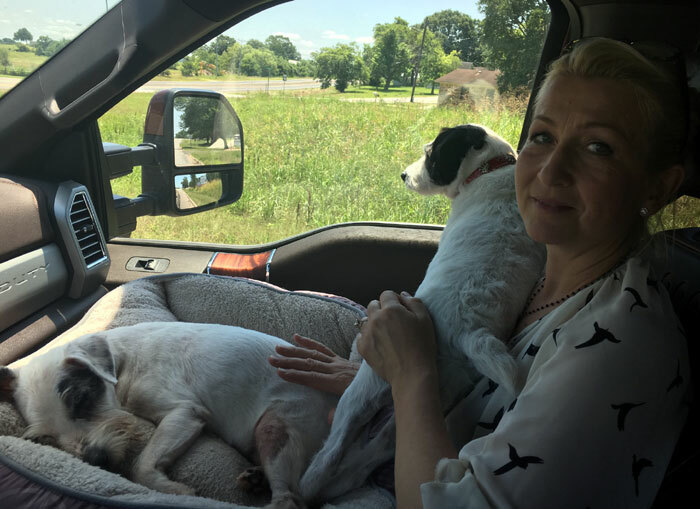 7/11/17 – Fannie saw the vet yesterday. She was such a good girl! 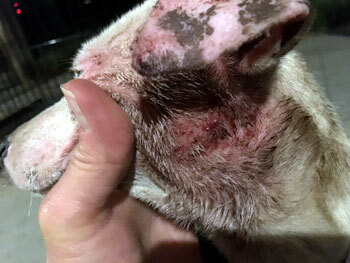 She is on several medications for her skin issues, and she will take those for a while until we see some improvement. She is doing much better already though. She was also tested for heartworms. 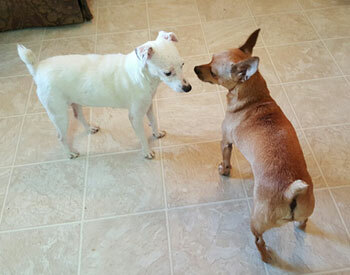 Unfortunately, Fannie tested positive for heartworms so she will need treatment for that. Her vet bills will increase due to the heartworm treatment. We are still short of our fundraising goal. No donation is too small. Every little bit helps! Thank you for your support! Make sure you check out the new photos we posted. Stay tuned for more updates and photos. This is the newest little Russell Rescue dog. 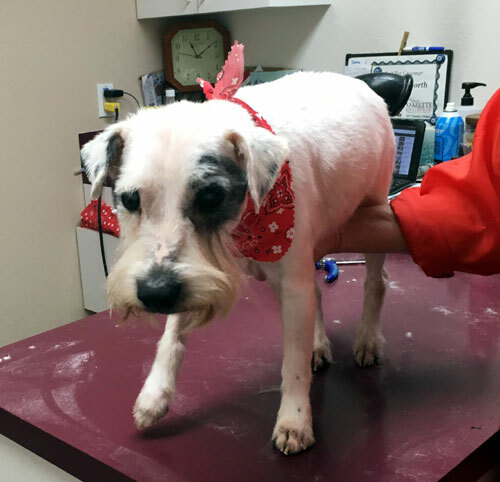 Her name is Fannie and she was found on June 19th, 2017 running around a convenience store in a very small town in south Texas. As you can see she has been chewed to pieces by fleas and ticks. The coat she has left is yellow and stiff. She is in bad shape. She is going to need several vet visits and good meds to get back to normal. This petite baby only weighs 10 pounds. 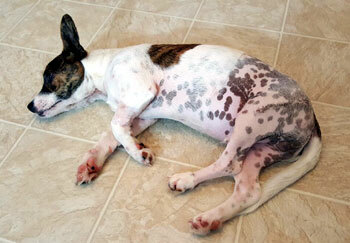 She is a perfect Jack Russell Terrier though. Her dew claws are removed and her tail and ears are perfect. But she needs your help to recover. 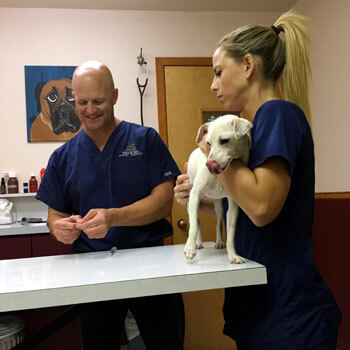 Fannie will see the vet in the next several days for a full evaluation. She will also be tested for heartworms at that time. 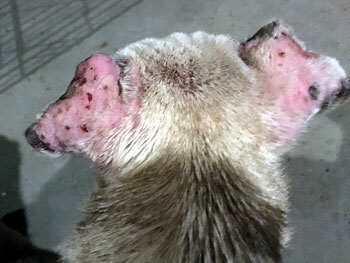 Then we will have a full picture of everything she will need in order to recover and be ready for adoption. 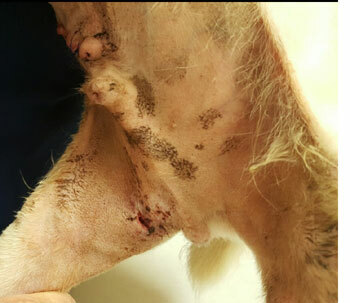 Can you help us pay for Fannie’s medical care? 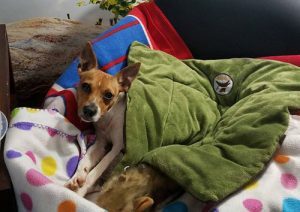 At this time, we anticipate that her vet bills will run around $400 unless she has heartworms and then it will be more. Any amount you can spare is very much appreciated and it all adds up. Thank you so much for your support! Donate to help Fannie. The Palmers adopted Romeo on June 10th! 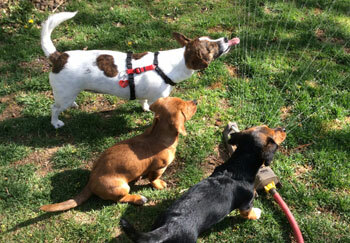 Romeo has a sister, Daisy, and a brother, Newton. Newton is a Russell Rescue dog adopted by the Palmers about 6 years ago. 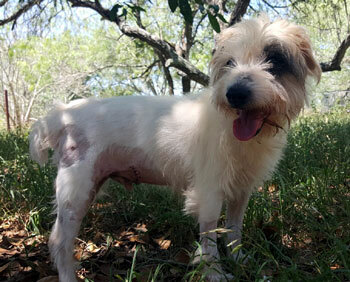 Romeo is a very lucky boy and we could not be happier for him. 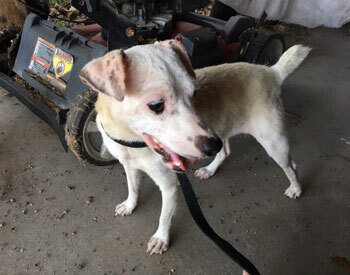 Thank you to everyone for your donations and support of this little JRT! He is finally home sweet home! 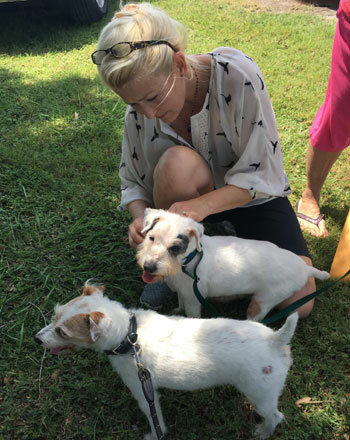 Happy Tails Romeo! Don’t forget to check out the new photos and the video. Here he is after being groomed. He was not too sure about being up on the table. He got home and took a long nap! Tune in next week for one more update on Romeo. We will have an announcement! I think everyone will remember Davey. 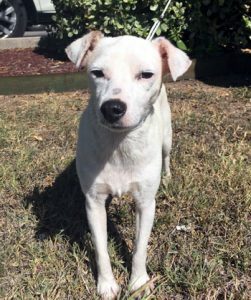 He was picked up as a stray in the Houston, Texas area and taken to a local shelter last summer (2016). 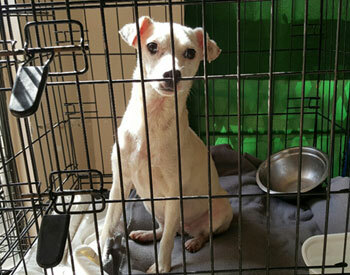 He sat in his concrete kennel for over a week with a broken leg. 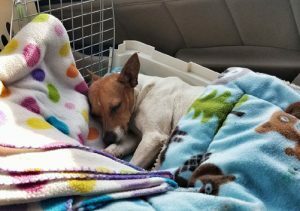 When Russell Rescue learned of his situation, Davey only had a few hours left before being euthanized. We quickly made arrangements to get him out of the shelter and to his foster mom. Davey went to the vet ASAP. 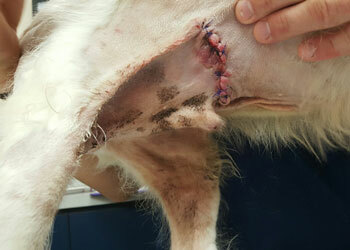 He ended up needing surgery to fix his leg. 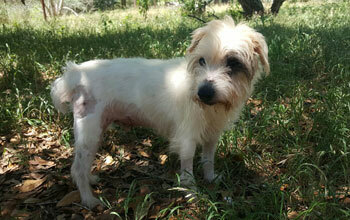 Davey got his surgery and spent many weeks doing his exercises and stretches while his little leg healed. He had an awesome foster mom who took great care of him! Davey found his forever family not long ago and he is living the life in Colorado! He is now called Vinny. He gets to go on walks, and play with his best buddy. As you can see in the video, his leg has healed! 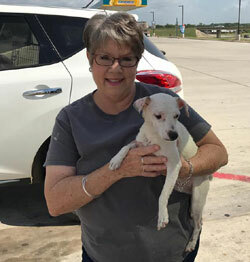 Happy Tails Vinny! We couldn’t be happier for you! Romeo had a checkup at the vet. I was able to get a couple of photos. You can see the puncture wound in his upper thigh. There is a corresponding puncture on the other side. The redness and swelling are going down, which is great news! Romeo got to spend a little time in the yard, which he loved! 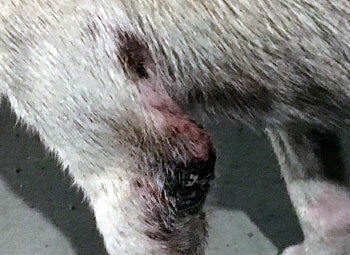 You can see from the photos that the puncture wounds are starting to heal. Romeo is feeling almost frisky again and is officially the Backyard Jungle King! 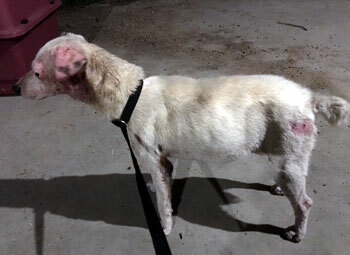 He is still limping, and I have to be very careful when I pick him up, as his torso is still very bruised and sore. He is such a little piglet. He never loses his appetite! He says to tell you thank you for your generous donations! Romeo was a good boy at the vet. They got him all stitched up. 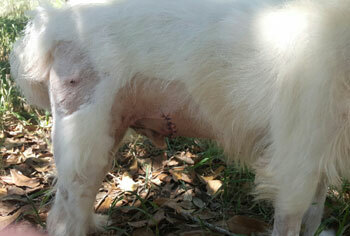 He has several puncture wounds and the cut on his belly that all need time to heal. He is having a tough time walking as he is pretty stiff and sore. He is on good meds and I am going to be keeping him quiet and still for a while. He is spending quiet time in the bathroom, which he hates! But Romeo is glad to be home! Romeo says thank you for your help!